Enhances the female sexual experience by helping to increase blood flow. Femme Alzare is an all natural sexual boost taken ten minutes before sexual activity. It is a revolutionary way to increase your sexual pleasure. Oral absorption is the fastest, most effective way to get a dose of enhancing supplements into your system. 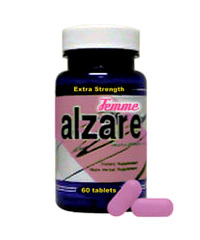 Femme Alzare immediately absorbs into your system to give you a fast, safe and effective sexual boost. To help these women, their dedicated team of researches have developed an amazing product called Femme Alzare. The manufacturer has carefully tested this unique new product so that it is fully doctor-approved. And, it is 100% guaranteed to work. It has been described as a true 'miracle cure', and they are now offering Femme Alzare in an easy to use liquid form to women everywhere. As they worked on the exact formulation of Femme Alzare for Women, they consulted with trained naturopaths with years of experience in helping women attain ideal sexual and reproductive health through herbal and all-natural means.